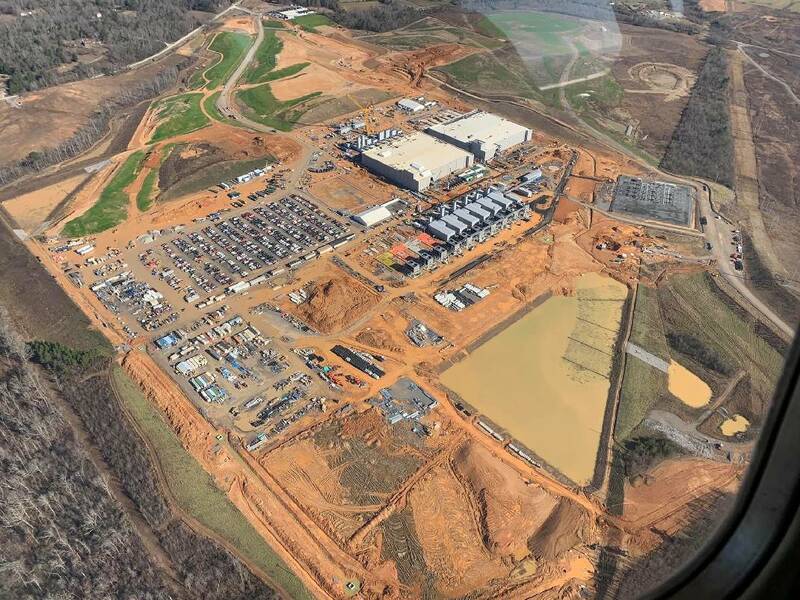 The Google data center being built near TVA's former Widows Creek fossil plant will be powered entirely by solar power bought by TVA. The federal utility created 86 years ago to harness the power of the Tennessee River is seeking proposals for other forms of renewable power, including solar and wind generation, to meet the growing demand for green energy from its customers. The Tennessee Valley Authority is soliciting proposals from the nation's top renewable energy developers to develop 200 megawatts of renewable energy that can be brought online by the end of 2022. Proposals are due to TVA by May 15 and, for the first time, may include battery storage options. Trey Danks shows off the Rossville Solar Farm that generates 200 kilowatts of renewable power for the Tennessee Valley Authority. TVA is soliciting proposals for another 200 megawatts of solar generation. The request for proposals is similar to the appeal for renewable power TVA made in 2017, which ultimately resulted in nearly 675 megawatts of solar power being developed to supply renewable power for Google data centers being built on abandoned TVA power plants in Alabama and Tennessee and Facebook investments elsewhere in TVA's 7-state region. The Silicon Valley tech giants have pledged to buy all renewable power in the future and TVA expects other energy users coming into the Valley to want similar carbon-free power sources in the future. "Two years ago, we were fortunate that there were so many interested parties to the RFP (requests for proposals), that we were able to expand our power purchase agreements to account for the nearly 700 megawatts of renewable power that we ended up needing to support both Google and Facebook," TVA spokesman Jim Hopson said Tuesday. "We were a little surprised in 2017 how quickly our renewable generation was taken up by large industries that have requested renewable power so we want to start that process again to see what the ability and price will be for additional solar power and other renewable power if we have customers that are asking for it." Last year, TVA is building two new solar farms to boost its total solar generation to more than 1,000 megawatts and TVA's long-range power plan being developed this spring, known as an Integrated Resource Plan, envisions TVA adding anywhere from 4 to 9 gigawatts of solar power over the next two decades while cutting the share of power generated by burning coal. The amount of the energy shift from coal to solar sources depends upon a variety of economic, regulatory and consumer practices. But in all 30 of the different approaches analyzed by TVA for the future in its draft Integrated Resource Plan for 2040, renewable energy is projected to increase and coal generation will decline. "Solar is becoming less expensive and a least cost option in the future so we do see a build out in solar capacity in all different scenarios," Hunter Hydas, a project manager for TVA's new Integrated Resource Plan, said during a Chattanooga hearing on TVA's long-range power plans last month. TVA, which was founded in 1933 and initially derived virtually all of its electricity from its 29 power-producing dams on the Tennessee River and its tributaries, currently generates more than 13 percent of its overall power from renewable hydroelectric dams, solar farms, wind generators and geothermal production. With its seven operating nuclear plant, more than half of TVA's power generation now comes from non-carbon sources. The new long-range power plan the TVA board is scheduled to adopt in August "gives us a direction, but obviously market forces are going to dictate the speed at which these new technologies and generation sources are adopted," Hopson said. "In the 2015 integrated resource plan, we were not expecting as much solar as we have actually added in the past four years," he said. But solar power backers claim TVA still trails other Southern electric utilities in pursuing more solar and wind power for its overall portfolio. "TVA is sampling the market with this RFP and we welcome that, but there is no commitment that TVA will buy this power and they seem to be simply responding to the growing business demand for renewable power," said Stephen Smith, executive director for the Southern Alliance for Clean Energy. "TVA is not putting solar on for its customers; it is only responding to corporations that are requiring renewable energy to locate in the Valley. TVA is not providing any leadership in renewable power — it is actually trailing other utilities in the Southeast in generating its own solar or wind power." The leadership in renewable power is coming from Google, Facebook and other businesses, Smith said. TVA President Bill Johnson said the federal utility is required under the TVA act to pursue energy sources that keep power rates as low as feasible. "So far, solar has tended to be more expensive since you still have to have backup power for when the sun doesn't shine," Johnson said. The TVA CEO said many environmental groups pushing for more renewable power want existing customers to pay more to fund premium payments to acquire more solar and wind generation. But Smith said he is confident in the long-run that renewable power from the sun and wind is ultimately cheaper than other sources because the "fuel" to power such generation is free and doesn't increase and there are not legacy cleanup costs like what TVA has faced with coal ash and nuclear wastes. "Because TVA doesn't have to go through the rate review that investor-owned utilities do, they do all of their financial analysis behind the curtain," Smith said. "We don't see any corporate commitment to renewable power yet from TVA."